With heavy heart and tears we say goodbye to yet another friend. 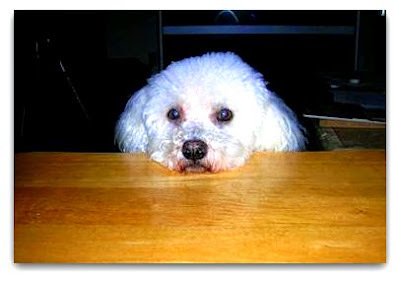 Turk you left your momma and daddy crying and the whole Tidewater Bichon Frise Rescue family grieving. No doubts about how much you were loved. No doubts that you will forever be remembered. "The BIG BOY." That's how my daddy remembers you. Momma says you were a Kody look alike and we all know that means she was smittened by you instantly. Auntie Robin remember you as a "sweet boy". Every single TBFR member has wonderful memories of you. I remember you as the most courageous Bichon I have ever met. I mean, who else had enough guts to try and take the chicken off the buffet table at the Bash? Nobody, except you! And the world did not end! And the hoomans did not do anything, but laugh. I know that your homecoming at the Rainbow Bridge must have been huge. So many of our friends have gone this year. Could you please talk to whomever is charge up there and them to slow down? I mean really. Turk obviously we will be here for your parents. Do visit your momma in her dreams. Let her know that you are ok. Puff can show you around, he is new there, but I am sure that Andy has guided him. I am just sad because I will miss you so. I need to be held now.